But long before DeFelice could make her dream become a reality, she encountered many challenges along the way. First and foremost, having little financial history and assets, DeFelice struggled to prove her business was viable to lenders. “One of the hardest parts of starting a small business as a young entrepreneur is that most traditional lending opportunities look only at the numbers and not your business plan,” she said. DeFelice wanted a neutral source of information and sought out Vermont Small Business Development Center Area Advisor Charley Ininger. “I was looking for someone who was not emotionally involved in my dream to give it to me straight. To ask me the right questions and give me the hard facts,” she said. Ininger offered advice on bettering her business plan, creating a timeline for business launch, mapped out to do items, including what items lenders and landlords would be looking for in an applicant, among other things. After being turned down for her business loan, Ininger recommended alternative lending sources. “If it wasn’t for Charley, I would have gotten lost after being turned down by the bank for the loan,” DeFelice said. Eventually, DeFelice successfully funded her business launch. But the pair didn’t stop there and put plans in place to ensure the business was successful after the doors opened. 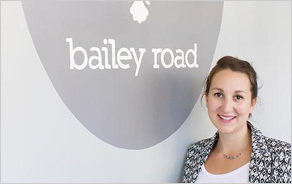 All that detailed planning and preparation has proved invaluable as Bailey Road looks to a bright future. “I am very proud to say that the last meeting I had with Charley we had to redo this spreadsheet because Bailey Road’s first year had blown it out of the water,” DeFelice said.